Myers Park - The perfect blend of traditional bones and character, with high-end modern finishes. MLS#3490956. HM Properties. Pharr Acres - Incredible school district and close proximity to Southpark, Cotswold, Myers Park with a short drive to downtown! MLS#3491549. Helen Adams Realty. Myers Park - House also listed in Land in MLS. MLS#3484065. ProStead Realty. 2 car backload garage under the house. MLS#3490873. Dickens Mitchener & Associates Inc. Perfect in-town location, walkable to Farmers Market on Kings, Greenway, Metropolitan shops & more! MLS#3490672. Dickens Mitchener & Associates Inc.
Home is ready to be renovated or is the perfect location for new construction. MLS#3490838. Pridemore Properties. Other special features are too many to list! MLS#3487506. Cottingham Chalk. Walk to Freedom Park, Dining, CMC Main & more! MLS#3476421. Helen Adams Realty. Highly rated schools, great SouthPark location! MLS#3488618. Ivester Jackson Distinctive Properties. Myers Park - Wonderful deck looking over the fenced in back yard. Minutes from uptown. MLS#3490092. Helen Adams Realty. This home is truly special and one of a kind. MLS#3486099. HM Properties. 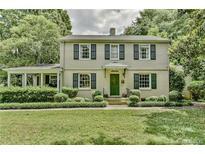 Myers Park - Large lot, detached garage, outdoor fireplace. This home has it all! MLS#3488417. Frenzel Properties LLC. Great room could easily be converted into 4th bedroom. MLS#3488660. Keller Williams South Park. Paver patio is oversized with low voltage lighting, a firepit and sitting wall. MLS#3485510. Pridemore Properties. 2 car carport under sunroom. Wonderful backyard backing to trees. MLS#3486864. Cottingham Chalk. Eastover - Huge attached workshop in back and circular front driveway for easy access and ample parking. MLS#3486818. Dickens Mitchener & Associates Inc.
Foxcroft - Covered outdoor living area with fireplace. MLS#3488620. HM Properties. Outdoor space boasts large arbor, Porte Coche, covered terrace, stacked stone fireplace,outdoor kitchen and detached 2 car garage with fenced in rear yard. MLS#3479747. HM Properties. The upper floor is a massive bonus room with skylights with 2 large walk-in closets (perfect for a beverage station), full bath, and access to the convenient walk-in attic. MLS#3488418. Savvy + Co Real Estate. Laundry "chute" between master closet and laundry/mud room. Two car garage MLS#3489398. Dickens Mitchener & Associates Inc. It offers a splendid island Kitchen, a split bedroom plan with private Master Suite built in 2018 with lavish bath, vaulted Living Room and vaulted Family Room, rich hardwood floors throughout, recessed lighting throughout, ceramic tile baths, architectural shingle roof, commercial grade gutters, plenty of parking, brick walled back yard and much more. MLS#3488751. Keller Williams South Park.